On June 18, 2018, Richard E. Engler, Ph.D., Director of Chemistry, Bergeson & Campbell, P.C. (B&C®), will present “New TSCA and Green Chemistry Innovation” at the 22nd Annual Green Chemistry & Engineering Conference (GC&E), hosted by the American Chemical Society’s (ACS) Green Chemistry Institute®. GC&E will highlight product innovation using greener chemistries and provide an opportunity for a diverse group of academic, industrial, and government stakeholders to network and learn about the newest ideas in sustainable approaches to chemistry, chemicals, processes, and products. The conference will be held in Portland, Oregon, from June 18 - 20, 2018, and online registration is now open. B&C is a proud sponsor. Richard Engler, a former EPA toxics official now a senior chemist with environmental law firm Bergeson & Campbell, attended the [Second Public Meeting and Opportunity for Public Comment on EPA's Draft Algae Guidance for the Preparation of TSCA Biotech Submissions] and said in a Nov. 3 interview with Risk Policy Report, "I think EPA's still figuring out what 'reasonably foreseeable' means. It's a challenge for chemicals as well as microorganisms. Noting that the Lautenberg Chemical Safety Act, which reformed TSCA, "is silent on microorganisms," Engler adds that the "effect of Lautenberg is parallel for chemicals and microorganisms." A key change in the updated law, Engler says, is the new requirement that EPA make an affirmative decision on whether new chemicals or microorganisms meet TSCA's risk standard of "will not present an unreasonable risk of injury to health or the environment," which is "true for chemicals and microorganisms." One difference that Engler notes is that if a newly submitted chemical "is a new microbe, it increases the data need for EPA to show not likely to present" unreasonable risk. Engler said that what Segal described is "what [significant new use rules (SNURs)] do. They limit releases of substances or an organism so the commercial activity in the notice is permitted but if another company wanted to use [it] in a different manner a significant new use notice is required." As an example, Engler said that "if a [microbial commercial activity notices (MCAN)] submitter had a contained use [of a microorganism] with complete destruction of the organism but if EPA was unsure . . . they might place a SNUR on the microorganism that the submitter or anyone else would have to abide by." In this example, as in other cases, Engler said, EPA would treat a new organism and the decision on whether to place a SNUR on other uses of that microorganism as it would a new chemical. "It's the same rules," he said. "The hazards are different, there are other risks because they're living organisms. There are concerns about gene transfer between the MCAN organism and whatever's in the wild. But the criteria is the same and the regulatory tools they use to contain are the same." One change that Engler noticed is that all SNURs will now be accompanied by a consent order. "EPA said that their interpretation of Lautenberg is that if they make a 'may present' finding, they must also impose a Section 5(e) consent order. In the past we could do a non 5(e) SNUR." "Their new interpretation is they have to do a consent order" with a SNUR," Engler said. "The effect depends on what the consent order says. It may say, 'SNUR is in effect until the SNUR is published'" once the commercial activity commences. "In the past, [5e orders] were typically used to impose testing" requirements. Like other elements of changes to TSCA, Engler said that the consent order changes will apply equally to chemicals and microorganisms. "With TSCA reform in place, I'm not sure what consent orders will look like," he said. "But that will be the same for chemicals and microbes." 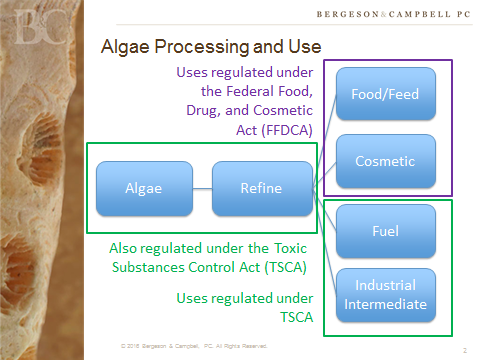 On October 12, 2016, the U.S. Environmental Protection Agency (EPA) announced a public meeting on the draft Algae Guidance for the Preparation of [Toxic Substances Control Act (TSCA)] Biotechnology Submissions (Algae Guidance) in the Federal Register. This meeting will receive public input and comments on the draft Algae Guidance that describes EPA’s data needs for supporting risk assessments of genetically engineered algae and cyanobacteria that are manufactured, imported, or processed, and are subject to regulations under Section 5 of TSCA. The meeting will be held in Tempe, Arizona on October 27, 2016. Only 120 people will be able to attend the meeting in person, however, due to space limitations. Registrants not able to attend in person can access the meeting through a live web stream and teleconference capabilities. Registration is available through the Eastern Research Group (ERG) website. Three months have passed since Toxic Substances Control Act (TSCA) reform was enacted, and now implementation trends are starting to take shape. 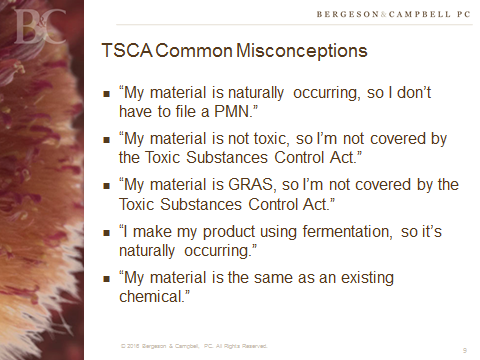 Rather than waiting to see what TSCA reform's impact on your business might be, take control of your approach to "new" TSCA with the information and insight shared in "The New TSCA: What You Need To Know" webinar series presented by Chemical Watch and B&C.